Supply chain professionals know that disruptions are inevitable. 87% of CSCOs say lack of visibility makes it difficult to proactively mitigate disruptions. No supply chain can afford to spend days mitigating disruptions, but especially not when you have a spend of more than $30 billion for a supply chain that operates in over 170 countries. Five years ago IBM's Chief Supply Chain Officer, Joanne Wright, set out to work with IBM engineers and craft a cognitive solution to her supply chain’s data overload challenges. Little did she know that a couple of years later the whole global supply chain profession would benefit from her intrapreneurship and ingenuity. Can you imagine what you could accomplish with Watson as your business trusted advisor? 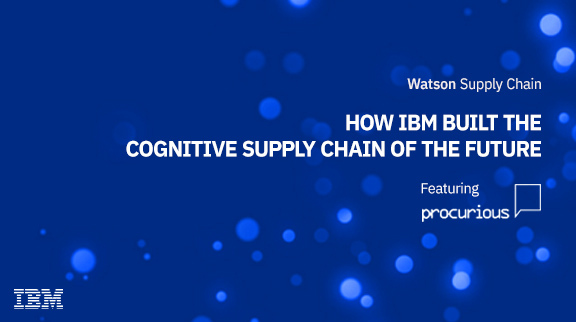 Register for the webinar and hear the story of the Cognitive Supply Chain!